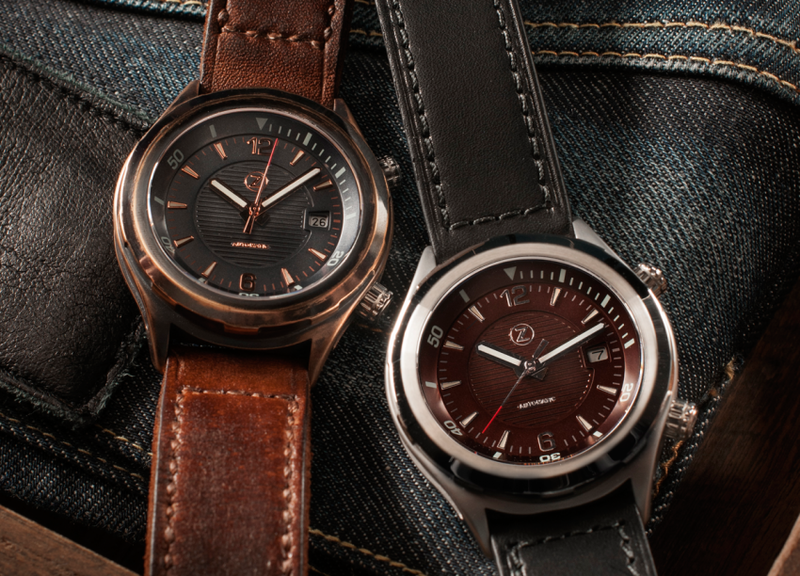 Zelos Helmsman bronze and bronze with DLC coated stainless steel bezel. 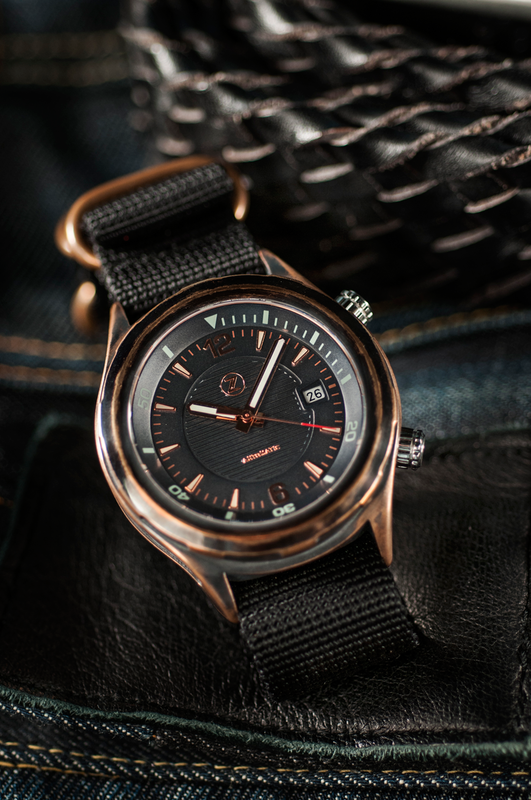 There is a new watch project launched today on Kickstarter, coming all the way from Singapore; the Zelos Helmsman project is proposing fantastic looking bronze watches. Since bronze is not everyone’s cup of tea, they are offering a version made of stainless steel too. But, let’s get back to the bronze, because it’s way more exciting, especially when considering the dial colours you can chose from: black, brown, grey and green. Not to mention the three straps that will come with each Helmsman, a vintage brown leather, a smooth black leather and a Nato strap. Why bronze? It is a metal much appreciated by artists because of its particularity to age fast, by creating a thin layer of protective patina on the surface, which gives each bronze object a unique look. A closer look at the Zelos Helmsman bronze buckle. The case back and the crowns are made of stainless to avoid contact of the bronze with the skin that in some cases might leave green marks on the skin. The three levels of the dial creates a sense of depth and the embossed lines will make you think of a ship’s deck. Elshan Tang, the man behind Zelos, is a watch collector and he brought all his passion into this project. I was curios to find out more about him and Zelos, here is a short interview with him. Please tell me about yourself, how did you got involved into watches? I started out with a love for watches almost 10 years ago as a teenager and have been collecting ever since. I only thought about creating my own watch brand last year right after receiving a bachelors in engineering when I realized it wasn’t that difficult after all! How about Zelos, is the Helmsman your first collection? The Helmsman is the first but definitely not the last! I chose a bronze case as I’m a huge fan of them, having had three Anonimo watches before. 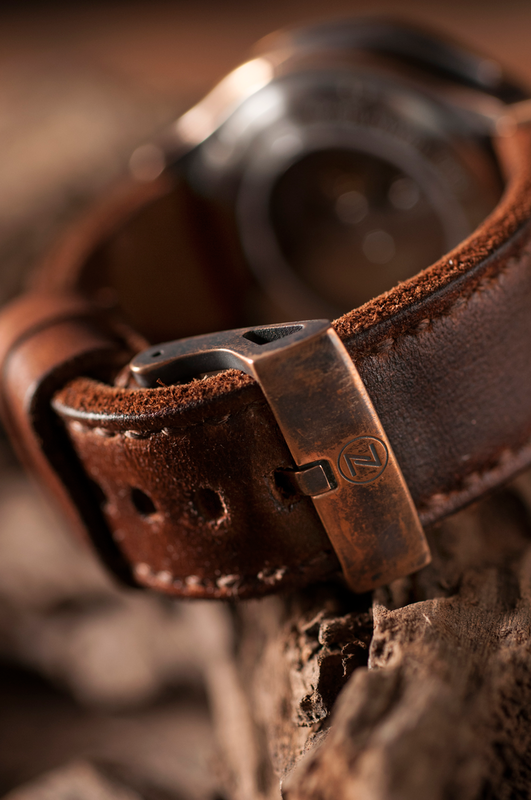 The patina on each watch is beautiful and a well aged leather strap matches it perfectly. Would you give us some insights on the design process of the Helmsman? I wanted a sporty watch but not something you’d commonly see among micro-brands, hence the dual crown design with an internal bezel. I’m quite a detail oriented person, so every little detail of the watch was considered. 3D dial for the depth, three finishings (polish, brushed, sandblast) for the casing, custom semi skeleton hands, custom buckle, engraved rotor and a PVD rose gold rotor in the works as well. What about post-Kickstarter? How do you see the future of Zelos in the medium and long term? I have a whole new design in the works which is something drastically different from most watches or micro-brands out there. Expect to see it right after production is complete for the Helmsman! 24 Jewel Automatic Movement Miyota 9015 with a 42 hours power reserve. I think with the Zelos Helmsman, Elshan really hit the nail on the head, the project was launched today and it already proved to raise a lot of interest. The fundraising will finish at the end of the March, production being planed for April and in May the first watches will go trough quality control before being shipped out. On Kickstarter the prices are between $380 CAD $420 CAD for the stainless steel to $590 CAD for the bronze with DLC bezel. You better take a look, while I was writing up this story, the early-bird offer for the stainless steel pieces was all sold out.